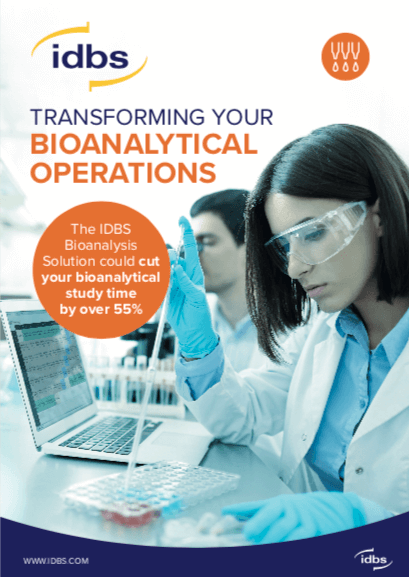 IDBS’ workflow execution system could cut your bioanalytical study time by over 55%. Is a lack of insight slowing you down? Many bioanalytical labs work with a crowded and siloed set of systems and processes. From part electronic to part paper-based workflows, to standalone point-solutions, the result is a lack of insight into data and slower reporting and results handling. So, how you can go beyond ‘automating the past’ and truly transform your bioanalytical operations? In this solution brief, we contemplate your disparate systems and consider whether they could be replaced by a single platform. Bioanalysis, the detection and quantitative measurement of drug products in biological samples, is a critical part of biopharmaceutical drug development. It arguably plays the most definitive role in tying therapeutic outcomes to the presence of pharmacologically relevant drug levels in the target biological system – starting with animal models and followed by humans. The focus of bioanalysis in the pharmaceutical industry is to provide a quantitative measure of the drug and/or its metabolite(s) for the purpose of pharmacokinetics, toxicokinetics, bioequivalence and exposure. Results of such studies are pivotal components of regulatory submissions that tie the drug to a specified therapeutic indication. As such, the success of the clinical development is heavily dependent on meticulous recordkeeping and reconciliation of the patient response/outcome with the bioanalytical data generated in the lab. As a vital component of preclinical and clinical drug development, bioanalytical groups are grappling with the pressure to improve efficiency while maintaining accuracy and reproducibility with the regulatory constraints of a compliant environment. The diverse nature of the individual steps in a given bioanalytical workflow requires a high level of accountability and traceability. As a result, and because they are typically paper based, there are multiple redundant processes that ensure compliance to the study protocol. This level of quality assurance (QA) places a significant burden on an operation and directly impacts the study turn-around time. While advances in detection techniques and instrumentation has vastly improved sample throughput, there is room for improvement when it comes to the myriad processes that drive sample analysis. This combination of controlled, compliant workflow execution and dramatically streamlined data acquisition is the next phase of innovation within bioanalysis. Advanced instrumentation and laboratory information management systems (LIMS) have boosted productivity, throughput, and scientific accuracy in bioanalytical laboratories. However, some bioanalytical labs have determined that this level of improvement is not scalable without a comprehensive data management strategy. on improving compliance. The transition from “train travel” to “space travel,” metaphorically speaking, can only occur if sample testing is tied to quality process improvement. Historically, labs have adopted a strategy that involves multiple systems that individually contribute to aspects of improving the bioanalytical operation. The end result of this strategy is a collection of software applications that need to be individually validated, managed and optimized. The complexity of systems for defining, testing, analyzing and reporting on sample analysis runs makes bioanalysis a prime candidate for advanced data management and automation of common workflows and reports. Both biopharmaceutical companies and contract research organizations (CROs) require a solution that brings significant efficiency improvements, integrates with other lab informatics and can cope with the specific needs of the broad range of studies performed. Further, the optimum system must provide an initial layer of quality control (QC) checks that address deviations at the time of execution, and not simply flag them for resolution after study completion. This paradigm, of ‘Audit by Exception’ has the potential to revolutionize the testing industry. The IDBS Bioanalysis Solution provides a study management and method execution platform that combines electronic data capture with structured workflows that drive standard bioanalytical processes. data acquisition and analysis, and workflow auditing. Based on best practices defined with the world’s leading pharmaceutical, biotech and CROs, the IDBS Bioanalysis Solution delivers a pre-configured solution specifically developed for both small and large molecule methods. These workflows are deployed within bioanalytical labs at biopharmaceutical companies and CROs across the globe. E-WorkBook offers powerful material creation, registration and tracking capabilities that are embedded within standard bioanalytical workflow. Data is entered once, and is automatically presented when needed. or a piece of equipment (pipette, balance or plate reader) can be investigated across all runs in a matter of seconds. Imagine how long it would take you to determine the impact of a suspect reagent or un-qualified instrument during an audit. Business rules govern all key aspects of the workflow, from ensuring instrument checks prior to use (such as for balances and pH meters) to acceptance criteria for captured measurements. Storage location tracking and solution genealogy (sub-aliquot relationships) are monitored using barcode scans and mandatory input fields. Labs that use industry standard bioanalytical LIMS can leverage tight integrations to ensure project and study hierarchy and attributes (project name, ID, analyte information, etc.) are automatically created and updated within E-WorkBook. Sample lists and run information can be retrieved and stored for easier referencing at the bench, such as in a specified plate format. Finally, result data can be transferred from LIMS (or even the analytical instrument) to the E-WorkBook spreadsheet for downstream calculations and reporting. All aspects of the solution are geared toward improving compliance and reducing QC burden. E-WorkBook eliminates transcription errors by directly accepting raw data, from a plate reader, and performing statistical analysis and curve fitting within a workflow. The built-in audit log monitors data input and GxP settings can be adjusted to full compliance mode where authentication credentials are mandated at each step of the process. QC of a study can move from manual checks of date/time 5 stamps, cross-reference checks of metrology logs, expiration date checks for all materials used and revisiting calculation to an exception-based auditing methodology. The IDBS Bioanalysis Solution is a single platform that facilitates documenting balance checks, recording of sample information for the analytical run, development and validation of analytical methods, preparation of reagents and solutions, integration with existing LIMS as well as tracking compliance issues. to be analyzed, a specific method must be developed and subsequently validated. Part of the process of method development is often to build on previous experience by re-using an existing protocol as a starting point for the new method. System flexibility is paramount during method development and E-WorkBook enables a user to quickly and easily clone methods to create new ones. A free-form environment can be used to develop protocols from scratch, while links to existing protocols give users the best of both worlds. As methods are developed, E-WorkBook instruction sheets are developed alongside them; these provide documentation for users to follow when performing the experiment and include links to the appropriate worksheet for data entry. Method validation is the process by which a method is verified to meet key requirements such as precision, accuracy, linearity and robustness. Unlike method development, method validation processes are subject to rigid controls relating to the analyte being investigated. Once a method has been developed, control substances of known quantities will be used to verify the method and determine detection sensitivity. All information relating to the method validation process can be captured within the context of the study and re-purposed as new methods are developed. Once methods have been validated, E-WorkBook data-entry spreadsheets can be locked-down to control data entry, thereby reducing the possibility of errors and deviations. The deployment of business rules within the bioanalytical workflow and the enforcement of workflow audit tools (such as counter signatures and reason for change codes) supports Good Laboratory Practice (GLP). with specific accuracy and precision acceptance criteria. If the calibration of an instrument falls outside the acceptance criteria, the user is automatically prompted accordingly and the potential issue is logged centrally, or remediated in real time. Components are available for weight sets, pH meters, pipettes and balances. By incorporating these workflows within the study, labs can eliminate the need for paper documentation such as balance use logs. Further, audits of reagents and solutions can be tied directly to the balance or pH meter used during its preparation. Users have the option to use a sample receipt and discrepancy tracking component (e.g. missing or damaged samples within shipment). A sample disposal record can be used to authorize and track sample disposal events. Additionally, integration with email systems can facilitate the routing and approval process for disposing samples. Samples can also be tracked from their storage location, say a freezer, and monitored for freeze-thaw cycles. The material receipt component can be used to record and track referenced standards and critical reagents. 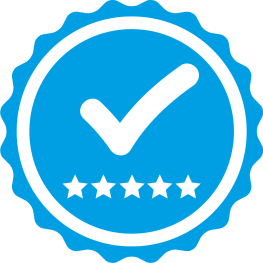 The component also includes the option to associate a Certificate of Analysis (CoA) that ensures appropriate correction factors and purity values are incorporated during reconstitution or solution preparation steps. CoA data can be recorded through the E-WorkBook interface and subsequently utilized in analytical method templates. This also includes the option to associate electronic versions of CoA documents, along with information about the biological matrices received by analysts. Once sample information contained within the CoA (purity, potency, active ingredient) is registered, it can be retrieved directly within a spreadsheet supporting stock solution or common reagent preparation. Workflows that support the registration of matrices and their pooling help manage the lab’s matrix inventory. All stock solutions and resulting working stocks used in a specific assay are recorded and traced. Furthermore, information relating to reagents (e.g. Control of Substances Hazardous to Health COSHH assessments) can be stored and handling instructions can be communicated to users. Reagent recipes are displayed from the method, however, daily preparations are scalable on the fly for current study needs. Weights and pH meter measurements are directly retrieved from instruments and electronically monitored for accuracy and compliance. These values can then be incorporated within calculations being performed during the preparation steps. This direct input of data prevents errors and increases the workflow efficiency. The effort invested in setting up the templates described above really pays off during method execution. For the analyst performing these experiments, E-WorkBook provides significant advances in day-to-day activities and delivers a major timesaving boost by generating sample preparation worksheets electronically. From an operational perspective, setting up experiments is largely automated, with pick lists ensuring accurate data entry and integration with LIMS, ensuring folder structures and results are kept synchronized. Major bioanalytical laboratories use a LIMS, such as Watson, for sample tracking within a study and to ensure tests are conducted in a consistent manner. Nevertheless, there is a large amount of critical information associated with projects, studies and daily runs, which is not captured or tracked in the LIMS but is still required to complete study reports – for example, analytical instrument setup, method validation documentation, sample QC and system calibration records. Typically, this information resides in paper lab notebooks or study binders. E-WorkBook has a number of specific tools for integrating with LIMS that can help streamline and enforce synchronization. For instance, E-WorkBook can automatically synchronize with the hierarchy setup (and security model) so that users have a familiar workspace within their electronic study. A record of the sample sequence, plate layout and instrument settings can also be extracted from Watson and presented as part of the daily run worksheet. Using the run ID, data can be retrieved without the need for manual file transfer or copy/paste functions. This can significantly reduce the QC burden and simplify the analyst’s day-today workflow. To maintain the integrity of the validated environment, E-WorkBook can be restricted to ‘read-only’ rights within the LIMS. As data analysis for non-compartmental studies is often done in LIMS, the study result can be imported directly into E-WorkBook. In addition, users of E-WorkBook have the option to exchange information with third-party analysis tools and include output results in analysis reports. E-WorkBook includes a comprehensive statistical engine as well as extensive graphic capabilities, giving users the option to use this native functionality rather than third-party software, i.e. do the non-compartmental analysis directly in E-WorkBook. E-WorkBook can work alongside existing infrastructure to link data repositories and instrument outputs. Information can be accessed and incorporated in reports easily to add context around experimental information. To assist sample handling, E-WorkBook links to label printers, reducing the probability of transcription errors between sample receipt and testing. 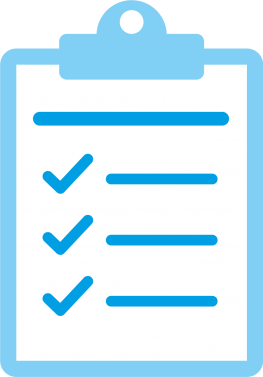 Task flow tools within E-WorkBook, which notify signatories of work requiring review and sign-off, when a study is completed etc., can work seamlessly with a laboratory’s existing email systems. This allows sign-off notifications and project status updates to be delivered via email, ensuring those people who need to be are aware of progress on studies and even individual analytical runs. 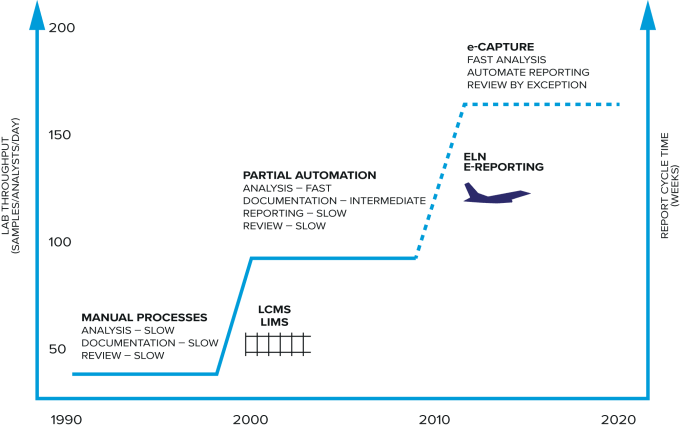 The need for accuracy, reproducibility and compliance with GLP demands accountability and traceability at every part of the workflow. In order to continually optimize processes in the laboratory, as well as meet the regulatory demands of bioanalysis results, a ‘top level’ view of assays and projects is required. E-WorkBook captures any deviation from the defined method, as well as tracking the progress of every experiment. This operational data is provided as KPI dashboards, such as the number of assays performed, average duration per assay, assays requested and flagged issues (such as calibration errors). This vital business intelligence enables the performance of the laboratory to be carefully monitored and optimized. the method, analysis or results to better understand the issues. The linking of data also allows flexibility in the pivoting and display of analysis and enables data entered during test assays to be related to business rules and SOPs. For example, in the event that a non-calibrated pipette is used during an analytical test, the event is recorded, along with the full calibration history of that apparatus. The study director can view all issues captured against analytical runs and make a judgement whether or not these constitute as invalidation of that experiment. 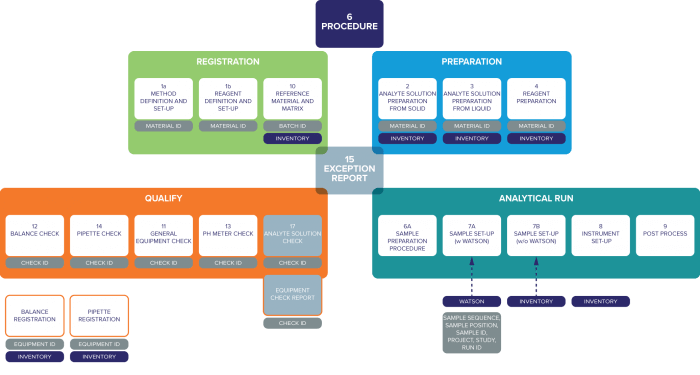 The IDBS Bioanalysis Solution provides a method execution and data management layer that spans metrology as well as material preparation and tracking. By incorporating business rules into each workflow, labs can enforce compliance and more importantly manage deviations. The IDBS Bioanalysis Solution has been shown to impact the time it takes to review data prior to releasing a final study report. Especially within the CRO industry, the operational aspects of the study (actually generating data) are tremendously efficient. However, there still remains a breakdown in efficiency when it comes to reviewing data for quality and compliance. The current process of handing-off paper notebooks to a QC team for manual cross-checks can hinder the release of results data. 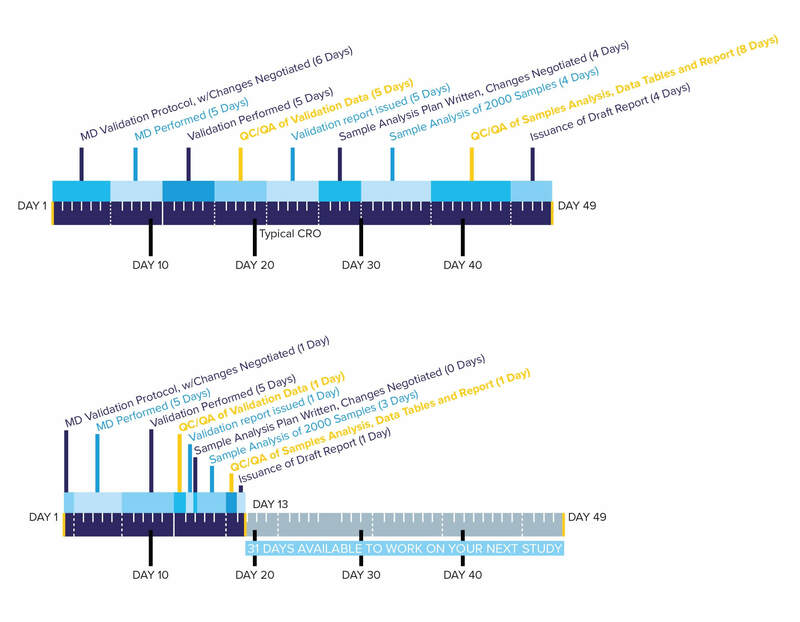 At a specialized bioanalytical CRO, The Director of Quality Assurance GxP, reported a 31-day reduction in study duration after implementing E-WorkBook for Bioanalysis within a validated bioanalysis CRO setting. Most bioanalytical operations look to headcount and instrumentation when evaluating areas for improved sample throughput. While increasing throughput may reduce your sample backlog, it only moves your bottleneck over to the QA review stage. A comprehensive solution for productivity improvement must also consider mechanisms to identify and eliminate deviations. The alternative will be to either repeat samples or justify the exception, both of which are costly and can jeopardize the entire study. As an extension, some may consider addressing inefficiencies inherent to paper-based processes as a way to raise productivity. Our experience indicates that a primary problem is not paper replacement but raw data review and ‘exception handling.’ The bottleneck is no longer one of lab or instrument capacity (i.e., operations) but one of data review (QC). E-WorkBook for Bioanalysis provides a mechanism to address both these obstacles. There is no arguing that laboratory informatics solutions such as LIMS, scientific data management systems (SDMS), electronic document management systems (EDMS), and instrument control software have significantly advanced the quality and quantity of bioanalytical data being generated. However, modern bioanalytical labs require a robust data management solution that improves workflow efficiency, simplifies the application landscape for the scientist and addresses the significant QC burden of each study. E-WorkBook is a single platform for comprehensive capture, storage and reporting of bioanalysis study data that integrates with existing laboratory infrastructure, thereby adding value rather than support burden to an organization. Implementing The IDBS Bioanalysis Solution has been shown to dramatically reduce the QC burden in bioanalytical laboratories whilst increasing quality. Furthermore, overall study times are dramatically reduced (upwards of 55% time savings) resulting in significantly faster study turnaround and therefore increased capacity, without the need for more instruments and people. 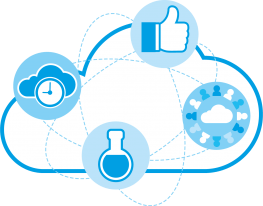 In this way, implementing E-WorkBook can take a lab far beyond the mere digitization of their current processes and lead to a revolution in how data and processes are managed.